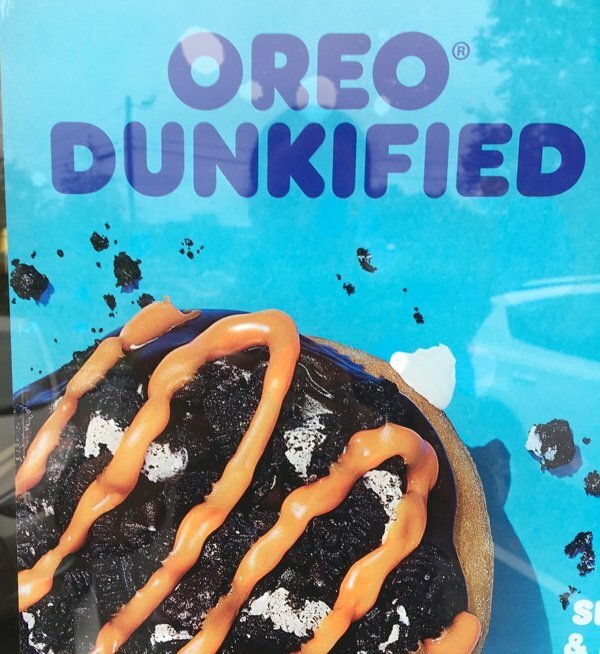 Are there healthy choices at Dunkin Donuts? A friend of mine asked me to find out. I live in New England where Dunkin Donuts literally can be found in every small town and on every other corner in big towns. It is truly laughable how many of these outlets exist. Why even try to find healthy food there? Aren’t they famous for stuff like this? That is what the world needs! An Oreo donut! Forget world peace. Believe me, it is far easier to find healthy food at Costco and do an Aldi review. But, Dunkin is changing its name from “Dunkin Donuts” to “Dunkin” and I believe they are doing quite well with the “I don’t have time to make breakfast” set. Dunkin is wading into the healthy eating arena with a DDSMART menu. These are considered reduced in calories, fat, saturated fat, sugar and sodium by at least 25% when compared to a “base” product. The base products are CHOCK FULL of fat, sodium, sugar, etc. so this reduction isn’t really significant. Many of the items on their DDSMART menu are not smart or healthy. For example, they have an oatmeal offering with 35 grams of sugar (7 teaspoons). OMG. And their multigrain bagel would be okay except it has 8 grams of sugar, 8 grams of fat, 380 calories and no cream cheese. Seriously, misleading. Am I just going to eat a dry bagel? This should have the nutrition information of the cream cheese incorporated into the offering. Duh. So, I decided to go sample what may be okay on their menu. 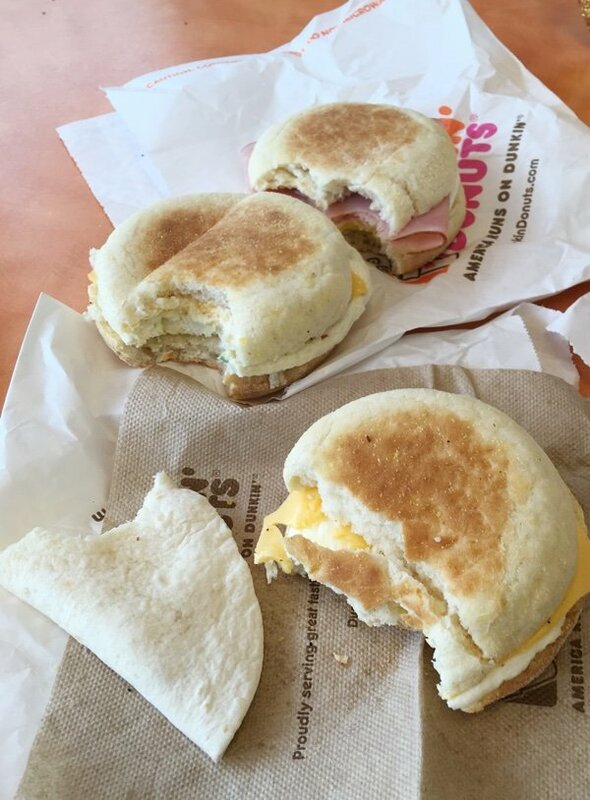 These heatlhier options comprised of egg sandwiches. I find that egg sandwiches are usually a great way to go and the McMuffin (without the meat) is one of my go-tos on the road. I don’t want to be negative, but this has got to be the worst fast food I have ever tried (and I have tried it all). 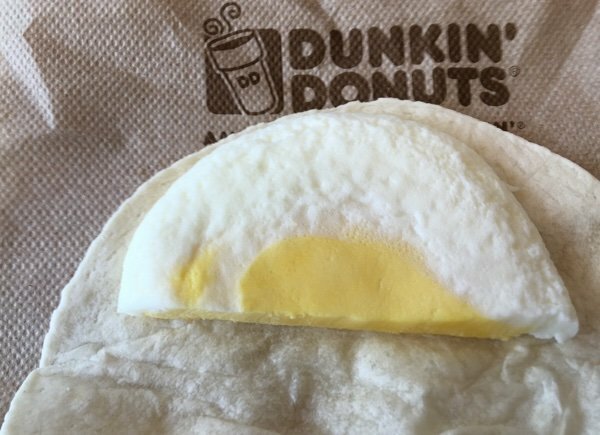 I wonder if Dunkin should have ever left their donut wheelhouse for these egg sandwiches. When I was in the store, I saw a man with a sandwich from Subway order a coffee. When I asked him why he hadn’t ordered the sandwich at Dunkin - he smiled and said that he preferred Subway. Yeah, dude, I am with you. I will start with the best of the lot which is the Wake Up Wrap sandwiches which you can customize. Since Dunkin only has American cheese (and I hate American cheese), I went with only an egg. I don’t understand how you can add 5 grams of fat to this without adding any flavor or butter - but they managed to do it. This is easily the best “healthier option” as it tastes okay and isn’t too bad in terms of calories but it isn’t whole grain, it is too high in sodium, and it won’t fill you up. It features egg white cooked with bell peppers, mushrooms, and green onions and it is topped with American cheese. You can leave the cheese off but they don’t tell you how that would change the nutrition information. These sandwiches are made with English muffins. These muffins (in my case) were not toasted and soggy. On top of that - there was no butter. It was like eating a sponge. This is way too high in sodium, not whole grain, and not packed with vegetables. The egg white omelet was rubbery and flavorless. Please pass on this option. Finally, we have a simple sandwich of egg and cheese on an English muffin that you can get at McDonald’s (and you should go there if you have the choice). Don’t be fooled by DDSMARTS. These are not healthy options and if you are looking for a fast food breakfast - go with Subway. You can get an egg sandwich with a bunch of vegetables piled on. 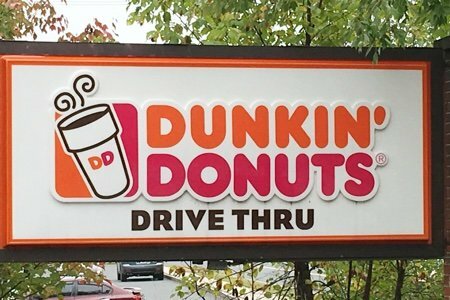 Have you tried any of these healthier Dunkin options? What did you think? 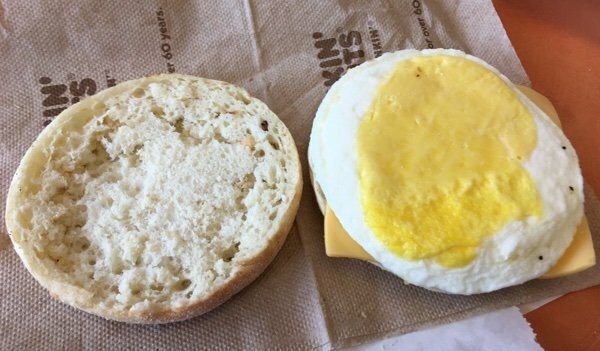 How are you sure that that egg was only half an egg for the $1.39 sandwich? It looks rather thick to me. I looked up the fat content of an egg - just an egg- it is 5 grams. Probably those egg sandwiches are nuked and not cooked in a pan. They also probably sit a while. That's why they are rubbery! Well, ick. Thank you for taking one for the team. Or maybe you actually had to take 3 or 4. Guess we won’t be taking our out-of-town guests there for b’fast. We wowed them yesterday with your Cottage Cheese Waffles. And gave them the recipe and the web site.....you rock. I disagree! I love Dunkin for breakfast! I get the veggie egg white wake up wrap and a large unsweetened iced tea with Lemon. I think I will stick with the donuts or muffins at DD or Big Y as I only eat 1 every other day. I've had their veggie-egg white-flatbread breakfast sandwich. It was awful. Flatbread was rubbery and dry. Egg white was awful. Mind you, I am NOT a picky eater, (although I wish I was.) I had a free coupon for this, so I didn't feel too bad when I threw it out after only a few bites. Why would anyone eat donuts from anywhere at all? There is approximately 800 calories in one donut as I recall. All Dunkin is good for is coffee. Eggs get rubbery not because they sit but because they are over cooked. My Doc's wife often gets the egg Mcmuffin and she is skinny as a rail. If you have one donut, what do you eat the rest of the day? Half or all your calories are sucked up with one donut whereas an egg sandwich may be only 250 calories. Is it WW or the "studio" of self indulgence? I lost 30 pounds in 1 and 1/2 months by eating eggs, protein (meat, fish and chicken) and very large salads. Count you calories. Donuts? Come on people, wean yourselves from sugar. Why bother to even come and confess on this blog or read it at all? I love their coffee (but bring my own soy creamer). Even in my pre vegetarian/vegan days I could never eat anything there. Donuts were too high in calories, sugar and fat and the breakfasts were unpalatable. So, while it’s nice not to be tempted, I wish they had a healthy option that I could eat when I need something to go with coffee. Dunkin coffee is the best but the only food item I have had is a toasted bagel. I would bring my own nondairy cream cheese. 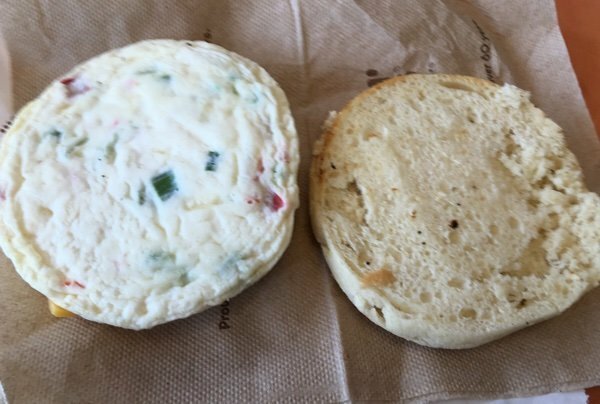 I like the bagel but once I had to give up gluten I don’t eat there. Go gluten free & believe me, you will stop eating fast food. I have not tried the donut shop (dunkin or otherwise) for breakfast. But, I do, on occasion, enjoy the egg bites - the egg white ones as well as the bacon and gruyere - at Starbucks. I don't eat eggs or donuts but those pics look like they are inedible. I do have a small addiction to their iced tea though!Our DD has bananas, that is about the only healthy thing I have seen on their menu. If you are eating only egg whites, you re cheating yourself out of all the nutrition in the yolk. There are many vitamins and mineral. B6, vit. A, calcium, iron for the heart for example. Selenium fights viruses and cancer also. Egg whites have only a small amount of protein and none of the other nutrients named here. There are 4 grams of protein 9% selenium, 6% B2, and 1% B5. Please eat the whole egg. Cholesterol is determined by genetics mostly not diet. See Harvard papers on this. I eat them nearly every day and my med labs are great. I am 67 and Doc says I have the labs of a 40 year old. I eat lots of eggs and lots of salads. IFortuna-- actually a glazed Dunkin Donut has 260 calories, not 800! Not saying they are healthy but unfortunately not all of us are able to give up sugar. A donut once in a while is not the worst thing in the world. I read this blog to get good ideas that are reasonable for me to try. Barbara S. - Thank you for the correction. I must have researched a Krispy Kreme (190 calories) LOL! Long ago when I researched a donut, it was listed as 800 calories. It *is* the worse thing in the world because of carbs, fat and sugar and empty calories. I am diabetic and would probably not buy donuts anymore. I was never one for sweets at anyway. Diabetes, once you have it, diet must be watched closely. My diabetes was trigged by cortisone shots, hubby's was from Agent Orange. I make dessert with Truvia. Pumpkin pie, good for you last I knew, is good for nutrition and lower in carbs than many other sweets.